French artist and author Solotareff provides readers of most ages with an alphabetical guide to identifying, understanding, and avoiding the witch community. This dictionary—more like encyclopedia—of information relating to witches covers such important topics as a witch’s favorite colors (“violet-ish, yellowish, olive-ish,…gloomy, pigeon throat, crimson”), the utter normalcy of witches’ brooms, and the side effects of green saliva. Every definition includes a perfectly apropos illustration, each one a crude hilarity. 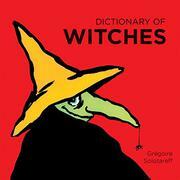 Some of the information is clear and straightforward: “Witches don’t have babies. Happily!” Other entries are trickier to parse but no less satisfying to mull over. For example, the page labeled “BABIES” states only that “Bats are mice that sometimes fly and from which witches have taken the fur to glue onto the heads of babies who were born bald. (See ‘Hair’).” Pure silliness is balanced with occasional nuggets of wisdom, and mild gross-out humor lives comfortably alongside poetic, intriguing prose. Some adults might balk at children reading words such as “stupid” or the one usage of “hell,” and others might wonder why a dictionary would neglect the letters J, Q, V, and Z. But those who would deny themselves the pleasure of this funny, strange, charming book are missing out.